It’s a question I get a couple times a month from blog readers, newsletter subscribers, or Facebook followers: I want to homestead, but my spouse doesn’t want to. How do I convince them? Now, I’m not a marriage counselor. But there are a few things that I think are important to keep in mind when trying to convince your spouse to homestead — a situation that often comes up as the modern homesteading movement becomes more and more popular. Grab a mug of something, and hear me out. Want to convince your spouse to homestead? Well…what’s your specific situation? With any couple that disagrees on embracing life as homesteaders, there is generally one of four situations to explain the differences in said excitement about jumping into the homesteading life. Which one describes the situation you’re in? Both of you are new to homesteading; one of you is excited to start, but the other doesn’t want anything to do with it. One of you grew up as/currently is a homesteader, but the other person doesn’t want that lifestyle. One of you has no homesteading experience, the other does and doesn’t want back into that lifestyle. Both of you were (or currently are) homesteaders, and one of you doesn’t want to do it anymore. The way to convince your spouse to homestead will have a lot to do with what their specific objections are, many of them having to do with what situation you/they are coming from. Here are a few objections that are pretty common. Let’s be honest. Maybe they think that by choosing to homestead, you will be taking on too much. Maybe they think you’re being unrealistic about what homesteading challenges you’re signing up for. Maybe they’re skeptical because your intense (but admittedly sudden) love for homesteading came from seeing a couple pins on Pinterest. And maybe you followed those pins down a rabbit trail and an hour later you were convinced that you needed to make homesteading your new life. Maybe you have a brother/best friend/co-worker who is doing it and you want to be just like them. Can you not handle death? (Because death is a pretty common thing on the homestead.) Do you have issues with taking on big projects and then not following through? Do you not like mess, dirt, or being outside? (Don’t laugh. I’ve talked with people who want to have goats and chickens and a huge garden, but cannot for the life of them handle being outside for longer than three minutes). Maybe you’re trying to convince your spouse to homestead because you’re absolutely sure that homesteading is going to save you a ton money. Friend, homesteading doesn’t always save money. In fact, depending on who you ask and what kinds of issues they’ve run into with homesteading, you might hear them say that homesteading isn’t any cheaper and in some ways, it’s more expensive. Maybe your significant other isn’t necessarily against homesteading, but knows they won’t be able to help (or flat out don’t want to) and don’t want their inability or lack of desire to help to be a constant fight between the two of you. Brutal honesty here? If your spouse supports you in your desire to homestead but straight up tells you homesteading isn’t a game they want to play, you can’t get mad when they’re not playing it. 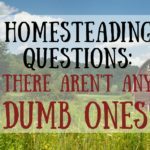 When trying to convince your spouse to homestead, you need to be clear about what you mean by homesteading. Perhaps they think you’re talking about moving to a 180 acre fix-it-up farm when you simply want to put a few chickens in the backyard. Modern homesteading encompasses a very large niche, let’s make sure that you’re on the same page about what’s even on the table. So, how do you convince your spouse to homestead? You. both. need. to. communicate. about. your. thoughts. on. homesteading. This means a full on why I want to and why I don’t want to presentation. This can be as simple as chatting over coffee or it can be as extravagant as a power point with supporting studies. Let each side present their case and listen to the other case. No yelling. No throwing wine glasses. No crying. You want to convince your spouse to homestead? You have to start by talking like adults and looking at things realistically. After talking you will probably find you’ve clarified some issues that can then be addressed. Your only hang up is you don’t want horses, cows, or goats? Perfect! I didn’t want those either! No, I wasn’t talking about moving to a huge farm. I just want to put in a garden and have a few chickens for eggs. No, I didn’t plan on going off-grid. Nope. Not at all. You can also explore some possible modifications and compromises to your plan. I realize you want to pay off the student loans first. Can we agree to officially start up our homestead in three years? I know you won’t be around to help with the daily stuff. But would you be on board with helping with a couple bigger projects during the year? So you don’t want to have free range birds…but you’d be okay with having birds in a large enclosed run? So, yes. Talk about all the homesteading things. Figure out what compromises and modifications you can make. But here’s the thing. When it boils down to it, they’re either going to be on board or not. And if they’re really seriously not on board, simply put, your choices are to either give up on your dream or figure out do it yourself where you currently are. And yes, choosing to gleefully go ahead with your homesteading dreams without the excitement and help of your significant other could eventually mean they will change their mind and become a Born Again Homesteader. But do not (repeat, do not) get into homesteading with the assumption that they’ll come around. I mean, it happens. But often times it doesn’t. And that leads to both parties being frustrated. If your satisfaction with homesteading hinges on your spouse being as excited as you are about the 27th hatching of ducklings, you might find yourself sorely disappointed. Yes, your spouse might “support” your decision to homestead, but that doesn’t mean they want to dig in with both hands every day. Kind of like you might support your spouse’s desire to hunt, but it doesn’t mean you want to accompany them on every trip out to the stand. But, Amy. Did you have to convince your spouse to homestead? Neither my husband nor I grew up as “homesteaders”. And while my husband always wanted to move from town out into the country, I’m not sure that that dream necessarily included, hey lets have 40 kazillion birds and have a super ginormous garden and make our own spaghetti sauce, m’kay? That was all the short blonde girl that he married. Don’t get me wrong, my husband (and our teen sons) are always helpful when I ask. There are things on the farm (like chicken butchering day) that require all hands on deck. But my husband has a wicked crazy work schedule and isn’t always here. And our teen sons definitely have their own things they’re into now. So while everyone else who lives here with me is helpful, the homestead isn’t really a passion for them like it is for me. The daily chores, the decisions that need to be made, the purchasing of animals, the trips to the feed store, the harvesting, the canning, the oh-my-word-so-many-things are 99.9% my deal. I once overheard my husband tell someone that the homestead wasn’t his gig, it was all mine. I thought it was silly for him to say that because he’s such a help to me when I need it. But really, in the grand scheme of things, I guess it is my gig. When I decide that I want to take on a new animal or make the garden bigger, it’s me who has to deal with dailyness of those decisions. And I think that’s important to keep in mind when you decide you want to do the homesteading thing. It’s charming to think the whole family will love it all the time and it’s going to be some magical Disney version of Little House on the Prairie type thing, but that’s very rarely how it works in modern homesteading. And you know what? That’s okay—as long as you are prepared for it. Realize that for 99% of us, homesteading is a choice. And let’s be honest here— in some ways, you’re choosing the more difficult way to do things. If your family wants vegetables or beef or eggs, there is a store somewhere in proximity to your home. I bet there is even a local producer of those things if you’re not wanting to depend on the store. So when you choose to homestead, you’re choosing to take on more work. Work that is sweaty and hard and dirty and sad but also amazing and uplifting and validating and rewarding. It’s a choice to live this life. Is that a choice you can make together? Love your articles!We settled on 4acres in country because I felt it is a healthy way for kids to grow up and it was.We all worked, played, prayed together and it did make for a close family.It brought fun chores and hard chores so the kids learned to help and contribute to the family .Character building . From the picture of your boys it looks like the rural life was good for them too! Alison M.
Thanks so much for writing that! I enjoyed it! And my farm is definitely my “gig” and as much as I wish my husband would LOVE it, our city/country mouse marriage will have to make it through somehow.. I need all the encouragement I can get because I would really like to see my dream in action and work with my autistic son on the farm daily! Sigh! I need some hope! But thanks again!